Founded in 1935 to provide Canada's farmers with a single voice in Ottawa, the Canadian Federation of Agriculture is the country's largest farmers' organization. Its members include provincial general farm organizations as well as national and inter-provincial commodity organizations from every province. Through its members, CFA represents over 200, 000 Canadian farmers and farm families. 4 links pointing to Cfa-fca.ca were found. Individual words like Agriculture, Federation and Canadian are frequently used in text links from other websites. The most important links to the website are from Hamiltoneatlocal.blogspot.com and Honeycouncil.ca. 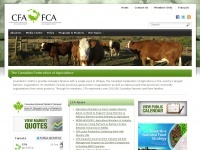 The homepage of Cfa-fca.ca and the subsite /fr are most referenced by other websites. The table shows the most important links to Cfa-fca.ca. The table is sorted in descending order by importance. The table shows websites of Cfa-fca.ca, which are often linked by other websites and therefore they are classified as important content. two profiles were found for Cfa-fca.ca in social networks. Among other social networks the website is represented in Facebook and Twitter. The web server used by Cfa-fca.ca is run by Unified Layer and is located in Provo, USA. On this web server 39 other websites are hosted. The language of those websites is mostly english. The websites of Cfa-fca.ca are served by a Apache web server using the operating system Unix/Linux (Unix). The software used to serve the webpages was created by using the programming language PHP. For managing the data of the webpages the CMS Drupal is used. XHTML 1.0 Strict is used as markup language on the webpages. The website does not specify details about the inclusion of its content in search engines. For this reason the content will be included by search engines.